Our service allows the entities submitting request for quotations to find, free of charge and in quite a simple way, the very services and products they seek. And the Suppliers and Contractors find new customers quickly and without any effort at all. Oferteo’s roll-out on the Polish market was in 2008. The Oferteo.pl service achieved a considerable success by helping companies and natural persons seeking specific services and products establish over a million contacts. Almost 300 000 companies and entrepreneurs from Europe have already become registered in our service. The experience we have gained to date helped us comprehend how we should establish our service in an effective and professional way. What are we like today? A team of specialists assures its appropriate functioning. Consultants see to the desired progress of the request for quotation submission process. 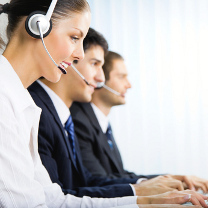 The Customer support group assists suppliers, and experienced IT specialist do their best to assure the best technical solutions to all service users. Each day we do our best to make sure that customers submitting their requests for quotation via our service receive the best bids possible. This is achieved among others by continual development of the base of our contractors and suppliers. We also strive to make sure that the suppliers and contractors registered in Oferteo would get more and more precise and commendable requests for quotation. We are grateful for your confidence and hope your transactions are successful!